Last week we shared a mini-tutorial on how to create effective first-person 3D HUD illusions with only a 2D plane. This week we are going to talk about the important information that the rest of the HUD will convey. 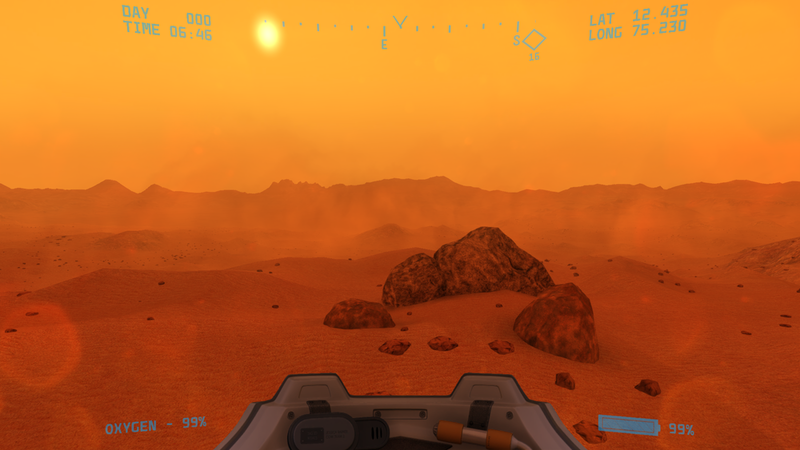 The helmet HUD is one aspect of the game that we are taking very seriously when it comes to balancing believability. We need to provide the player with relevant, contextual information at all times without overwhelming the player or breaking our fictional ruleset for immersion. There are dozens of background survival and navigational stats in Lacuna Passage that the game is keeping track of; however, not all of these are relevant to the player and some are simply unbelievable. We have a distinct variable that measures your exhaustion level, but it wouldn’t make much sense for your space suit to relay this variable to you directly. Though our game is set in a science fiction universe, we are trying to constrain ourselves by the realities of modern space travel. How would a space suit measure a trait like exhaustion? Well, we can instead filter this information and display it in other ways, like blood pressure, heart rate, and other bio readings that a space suit might be very capable of measuring. In creating an immersive HUD we are trying to avoid abstract forms of information like health bars. We have a very simple battery indicator for instant recognition of current battery levels as well as a percentage to give you more granular updates. Perhaps one of the most important survival stats in the game. Keeping this information visible at all times in the helmet HUD ensures that the player won’t be surprised when they run low on oxygen. Navigation in an open-world environment is critical. This age-old method of wayfinding is made even more useful with the inclusion of the diamond-shaped waypoint to lead you to known locations; however, if you are searching for unknown locations then you are on your own. Another useful tool for navigation. 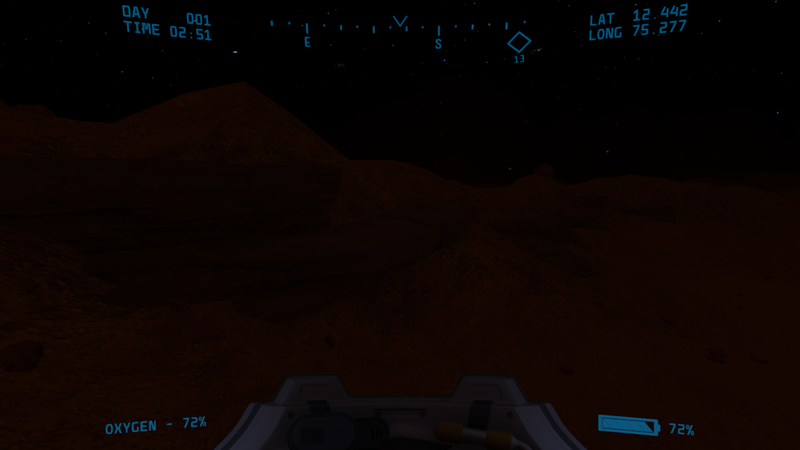 When traversing terrain with no visible landmarks it can be easy to get lost. With Lat and Long headings you can know exactly where you are at all times. There may also be a need to record Lat and Long headings that you want to revisit later (or add as a waypoint on your compass). Despite the fact that the Martian day is 2.7% longer than a day on Mars, it still has a 24 hour clock. Knowing the exact time allows you to more accurately estimate how long your battery or oxygen might stay within safe levels. It can also be useful to know how much time you have left before dark when temperatures drop to dangerous levels. The important thing about these stats is that they are constantly updated and available at a glance. Many of our other secondary stats will be displayed via a wrist display that can be brought up to your visor for viewing when necessary. Both our helmet and wrist displays are fictionally and internally consistent helping to create a more immersive experience for the player.